Opuscula 8 is now available for purchase and free download at Bokorder.se. Also available at Amazon.com, Bokus.com and Adlibris.com. Anton Bonnier | E. Mackil, Creating a common polity. Religion, economy, and politics in the making of the Greek koinon (Hellenistic Culture and Society, 55), Berkeley, Los Angeles & London, University of California Press 2013, xvii + 593 pp. ISBN 9780520272507. Maria Mili | I. Polinskaya, A local history of Greek polytheism: Gods, people and the land of Aigina 800–400 BC (Religions in the Ancient Greek World, 178), Leiden, Brill 2013, xxviii + 690 pp. ISBN 978-90-04-23404-8. David Westberg | P. Ceccarelli, Ancient Greek letter writing: A cultural history (600 BC–150 BC), Oxford, Oxford University Press 2013, xviii + 435 pp. ISBN 978-0-19-967559-3. Otto Linderborg | E. Carawan, The Athenian amnesty and reconstructing the law. Oxford, Oxford University Press 2013, 310 pp. ISBN 978-0-19-967276-9. Adam J. Goldwyn | Daughters of Hecate: Women and magic in the ancient world, ed. K. B. Stratton with D.S. Kalleres, Oxford: Oxford University Press 2014. 552 pp. ISBN 0-19-534271-2. ‘Book reviews’, Opuscula. 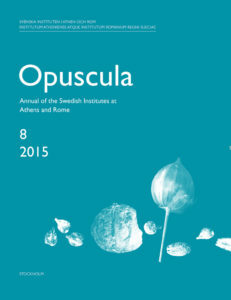 Annual of the Swedish Institutes at Athens and Rome (OpAthRom) 8, Stockholm 2015, 189–196. ISSN: 2000-0898. ISBN: 978-91-977798-7-6.